Las Vegas is a desert city filled with harsh neon lights and the loud cacophony of people looking for a quick buck. Trevor (Haley Joel Osment) is a skinny 11-year-old living with his shaky alcoholic mother (Helen Hunt). When his new seventh grade teacher (Kevin Spacey) sets an assignment: Think of an idea to change the world -- and act on it, Trevor comes up with an extraordinary concept. Trevor's idea, as his teacher points out, requires a tremendous "leap of faith". Choose three people and do for them three really big favours. The favours have to be hard for you to do. In return, you ask each of those three to do three really big favours for three other people. 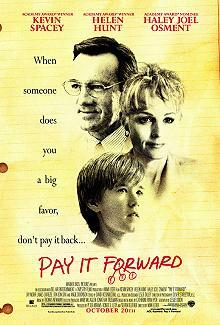 You pay it forward instead of paying it back.